STUNNING couture contemporary rhinestone headband - SALE! HOME / WEDDING HEADPIECES / Wedding Headbands / STUNNING couture contemporary rhinestone headband - SALE! 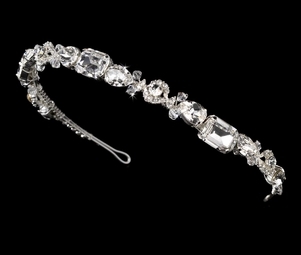 Description: this stunning headband features a single row of unique rhinestones. Perfect for the classic or modern bride, the ornamented portion of the piece measures 12-1/2" wide and 1-1/2" tall.